Lightly macerated with a peppery sweetness, pickled strawberries lend a welcome complexity to arugula salads with candied pecans. They can also serve as the perfect topper to a fresh goat cheese-smeared cracker or a bowl of vanilla ice cream. Wash and hull the strawberries, slicing them in half and quartering any huge ones. Place them in a glass jar or a non-reactive container that has a lid. Add the mint leaves and peppercorns. In a glass bowl, combine the salt, vinegar, sugar, and mirin. Stir to dissolve the salt and sugar granules. 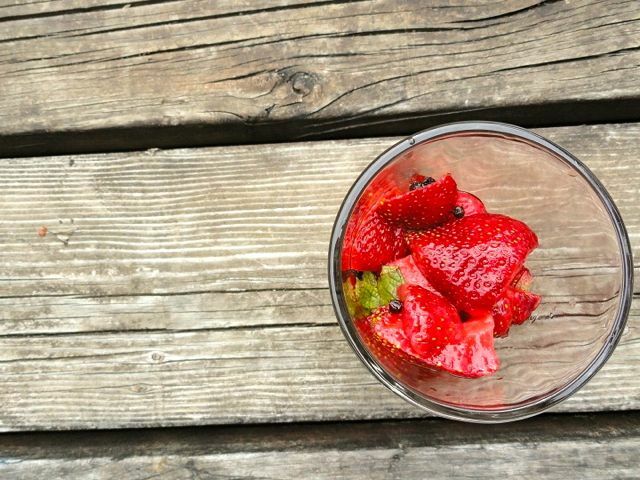 Pour this liquid over the strawberries. Shake the container a few times to mix it all up. Set aside for a few hours to let flavors develop.